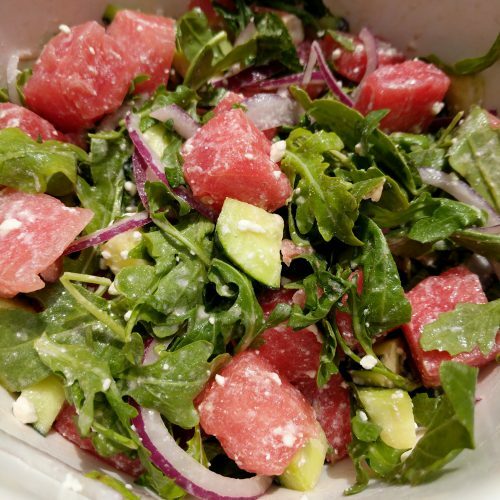 The watermelon feta salad is a low fat and refreshing treat! 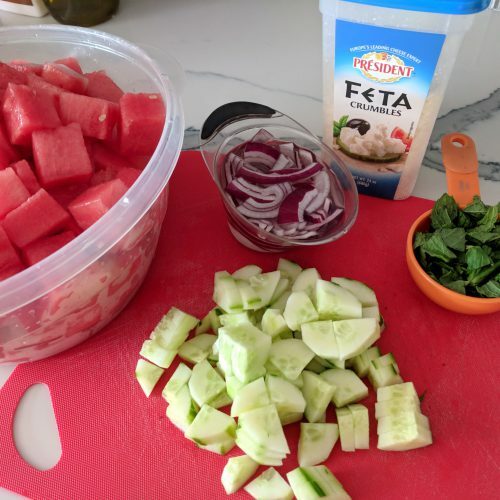 It is super easy to make and takes 15 minutes or less, depending on how good you are at cutting watermelon! The key to this recipe is picking the perfect watermelon. There are a couple key things to look for when choosing your watermelon. It should feel heavy (regardless of size), a creamy yellow spot means its ripe and if you tap on the underbelly, it should sound hollow. 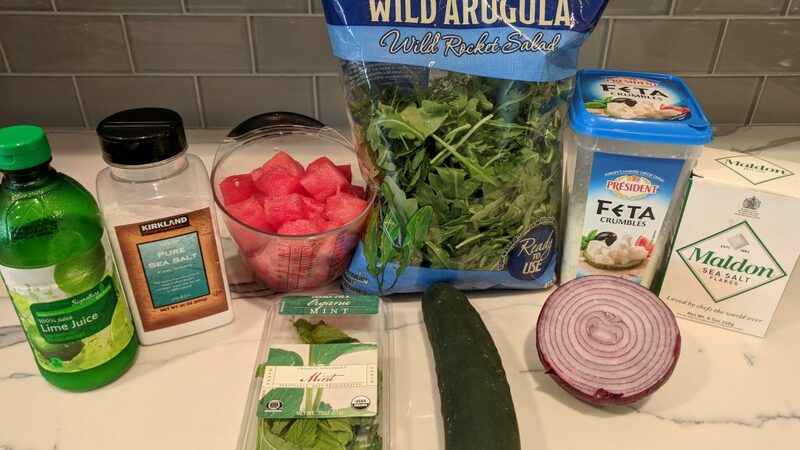 Watermelons are in season from May to September so get out to your local store today and get on this recipe! 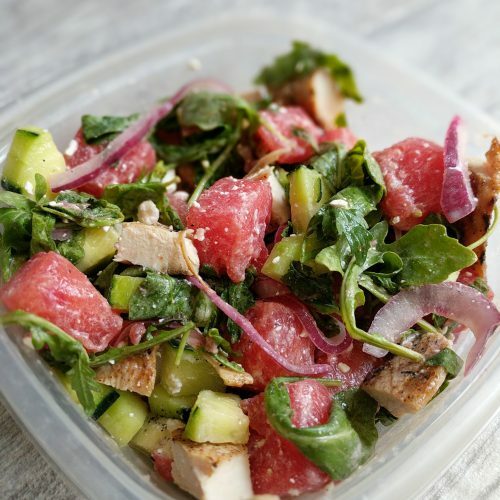 This salad is packed with arugula, mint, watermelon, cucumber, red onion and a lime dressing. Per serving it has, 117 calories, 5g fat, 12g carbs and 6.5g protein. I ate this as a side and then another time I added 4oz of grilled chicken to it. With grilled chicken the stats are 247 calories, 7g fat, 13g carbs and 32g of protein. LET’S GO!! I grew up putting salt on watermelon. Its a thing. Once you start, you never go back. My mom did this when we were kids and it stuck with me. The first time my husband saw me do it, he was appalled. But its good I swear!! It really brings out the flavors of the watermelon. Think sugar on strawberries… you don’t think that’s gross now do you?? Ok, so I love grilled onions but raw onions….. not so much! 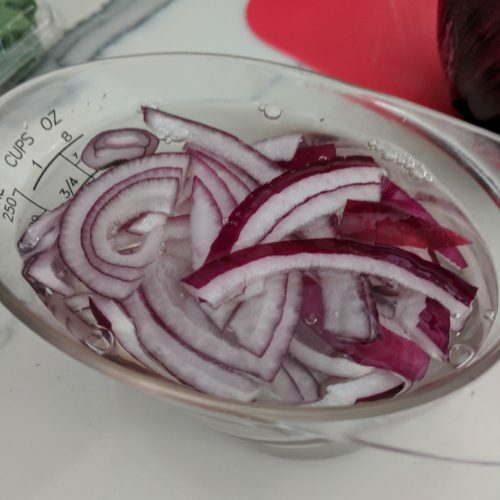 My buddy actually taught me a trick of soaking the onions in water and a dash of salt for 5 minutes and then patting them dry to help get rid of the bitter onion taste. I have to say… it worked! If you like raw onions then please just skip this step. However, if you have never been a fan of them, give this trick a whirl! I think soaking them combined with the lime juice really softens the taste! 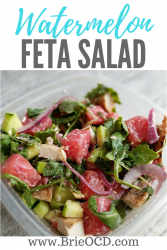 This is a great summer salad to bring to a bbq or add grilled chicken and make it the main event. Either way, it is sure to delight! Enjoy! cube watermelon, chop mint and cucumber. 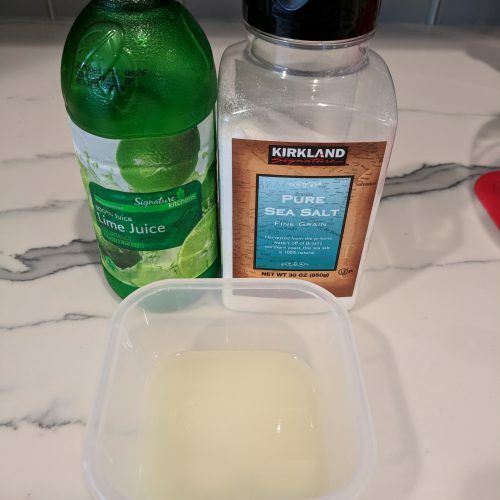 in a small mixing bowl combine lime juice (fresh or bottled) and salt. stir and set aside. 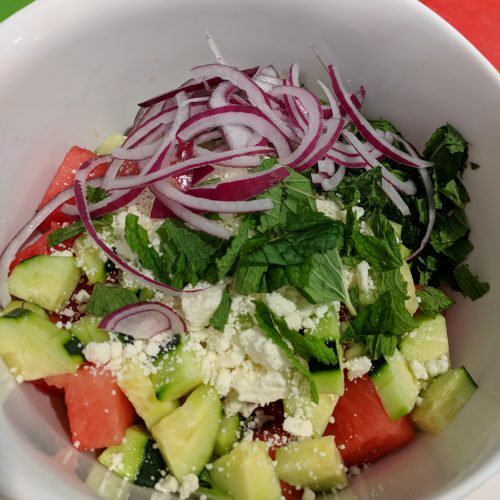 in a large mixing bowl combine arugula, watermelon, mint, feta, cucumber and dry onions. add dressing and toss to mix. top with flaky sea salt (optional). Serve as a vegetarian salad OR add grilled chicken and Enjoy!